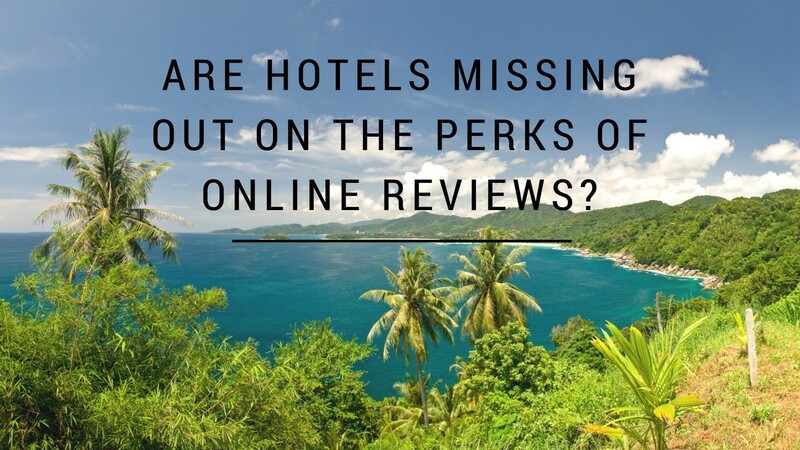 Are Hotels Missing Out on the Perks of Online Reviews? Why will it benefit me? The consumer society today is reliant on the internet more than ever. This dependence is projected to increase exponentially in the years to come. In the light of such circumstances, it becomes quite imperative for businesses to make use of online reviews. Some businesses use the feedback to identify and rectify their shortcomings. Others, with a smarter strategy, use feedback from their customers to add to their Online Reputation as a part of their Reputation Marketing campaign. Whichever the case is, online reviews have become essential to the success of businesses, but for some reason, the hotel industry has been slow to catch on to this booming trend. Why Are Reviews Important to Hotels? It seems as though hotels have a knack for keeping consumer reviews hidden under the table. With such practices being employed by the hoteliers, it is natural to assume that platforms for customer feedback do more harm than good to the business of a hotel. On paper, this theory appears quite reasonable, but the reality of the situation is that hotel owners and managers are failing to look at the bigger picture. Consumer reviews go a long way in drawing more clients into a hotel. Studies have proved that positive consumer reviews can have a positive effect on the sales of a hotel to a great extent. When the prices of two hotels are the same, customers are 3.9 times more likely to choose the hotel which has the higher review ratings. When prices are increased by hotels that have commendable review ratings, most customers are not deterred from booking rooms in those hotels. In other words, raising the price does not usually compel customers to change their minds about a highly rated hotel. According to the study, 76% of the customers have no problem in paying extra to attain a room in a hotel that has higher review scores compared to the cheaper hotels that have mediocre or poor ratings. Why Hotels Ignore Online Reviews? The negative perception that hotel managers and owners hold towards customer feedback is quite understandable. Often times, fake and malicious reviews are posted on hotel review websites such as Trip Advisor which significantly damage the reputation of the hotel. This is the reason why the owners are reluctant to allow customers to leave a feedback on the hotel website or the hotel Facebook or Twitter account. That being said, hotel owners need to realize that negative feedback will never go away. Whether they are generated by fake accounts or real customers, each client complaint should be seen as an opportunity by hotel officials to turn trash into treasure. Negative reviews can be converted into positive reviews with top notch customer care service. It’s all about having the right attitude and decency to understand the client’s inconvenience and help them out unconditionally. 1 Not Posting Reviews: Some hotels, for example Travelodge in the United Kingdom, do not let their users access any guest reviews or view hotel ratings. This is a very poor marketing decision on their part since TripAdvisor page of their hotel is filled with positive reviews from satisfied customers. 2 Misplaced / Mistimed Ratings: Some hotels tend to display a rating only at the time of the booking. This makes very little sense as visitors who are on the booking page have already made up their minds about the hotel. The ratings should be displayed at the homepage, where most visitors are searching for information. 3 Unclear Review Score: Some review scores and ratings posted on hotel websites can make life more difficult for the visitors. There is often little or no information to suggest what the score refers to or how what it is based on. Such misleading information can put off most of the visitors. 4 Linking to Trip Advisor: Some websites simply post a link of their Trip Advisor page on their website. This move is not as bad as the others mentioned before, mainly because they are allowing the customers to know how well the hotel has been rated by an authoritative review website. However, linking to Trip Advisor or any other hotel review website takes the customers away from the Hotel website and entices them to explore other options on the review website. Jean-Marie Chauvel has over 25 years of experience, acquired in Europe and the USA, in Sales Performance, Sales Promotion & Online Marketing. For the past 10 years, he has been in charge of MAXXCOM Internet. The company provides Innovative Marketing Solutions to Businesses all of sizes all over the World. Being an Expert in Reputation & Branding, Jean-Marie has conceptualized, with his team, a powerful Reputation Platform allowing companies to regain control of their Online & Offline Brand Image. Reputation Aegis is a complete Customer Intelligence Platform. Wednesday, 01 February 2017 Why Brands Need to Build Trust? Saturday, 10 September 2016 Why every Local Business should adopt the Barnacle SEO Strategy? Sunday, 24 July 2016 Are Hotels Missing Out on the Perks of Online Reviews? How to Generate Positive Online Reviews? Why Brands Need to Build Trust? Your Reputation is Everything, Protect it Now! In this 24-page eBook, you will discover How to Take Control and Protect Your Online Reputation. Before You Leave... Subscribe to the Blog!